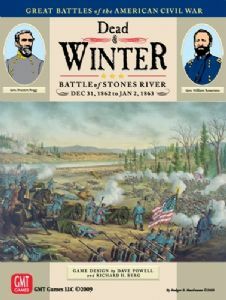 The GBACW series is one of the hobby’s longest lived design concepts, springing from the legendary regimental Level Gettysburg game -Terrible Swift Sword - created by Richard Berg in 1976. Since then, the series has undergone numerous system evolutions, always seeking to enhance the player’s illusion of reality. Today, the series relies on inter-active chit-pull mechanics to simulate the sometimes chaotic nature of the 19th Century battlefield. GMT's Red Badge Of Courage and Gringo! Are the two most recent releases in this classic line of games. 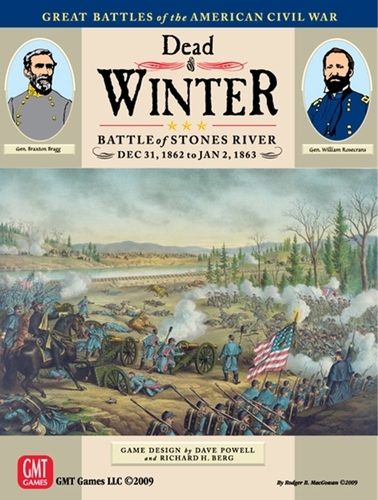 One Introductory and ten regular scenarios examine every aspect of the historical battle and present the players with several plausible alternative situations based on events leading up to the actual engagement. Scenario sizes range from one-half of one map and an hour to play, to all four maps and many enjoyable gaming hours. Also included are a number of optional forces that could have plausibly been brought into the fight; Keep your opponent guessing as to what he will face next with this interesting range of options. Dead of Winter II completely revisits this battle. The old version needed a face-lift. The biggest change is in returning the ground scale to 110 yards per hex. While going to the larger scale means an increase in maps, the added elbow room allows for much more historical unit frontages and more playable stacking.